I want to cut some boards to be used as the covers for a book. The boards would typically be about an eighth of an inch thick and book size in dimensions (the average book is 9" x 6"). What would be the best way to cut the boards to minimize the chance of warping? Since book covers are not attached to anything, there is nothing to resist the board from warping, so a cut is needed that will cut to an absolute minimum the chance of warping. As I see it, there are two basic possible approaches. One is to cut the board radially through the log (shown as A in the figure below). 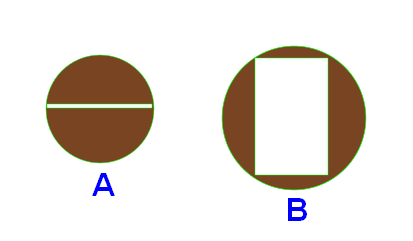 The other is to cut the log like a salami, and then cut the rectangle of the board out of the salami slices (shown as B in the figure below). Method A has the advantage that a smaller log could be used. For example, a 9x6 cover would require a timber of 6" diameter using the cut in A, but in B, the diameter has to be the length of the diagonal, or about 11" in the case of a 9x6 cover, which is almost double A. However, on the plus side, a single tree will provide a lot of salami slices, but only a small number of radial cuts. Now, as I understand it, a tree absorbs water longitudinally, so in the case of A, moisture would be absorbed at the top and bottom of the board, so this could lead to the top and the bottom swelling more than the middle. However, in B, the moisture would be absorbed equally across the face of the board. So, based on this idea my expectation is that B would be less susceptible to warpage, but I am asking here to verify this idea. 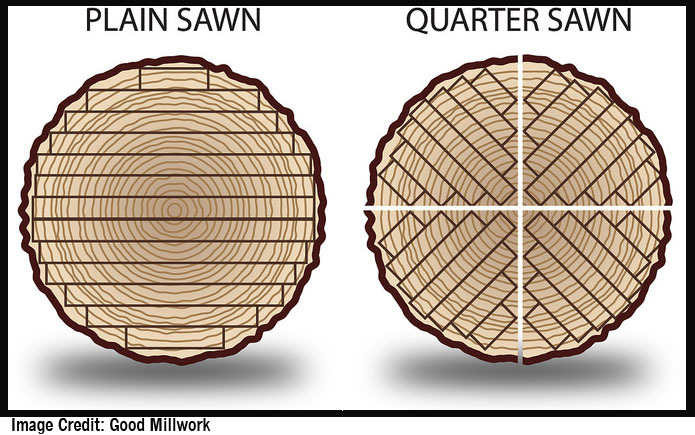 Are you familiar with how the wood fibers are aligned in a tree? They (mostly) run from top to bottom and are bonded together with lignin. If you used the 'B' method the wood fibers would be running into and out of the page when viewing your diagram. This would make the bond between neighbouring fibers short and weak - the cover would snap easily. This is why wood is very rarely cut this way. For stability you want quarter sawn wood. This is because wood expands twice as much in the direction along the growth rings than in the direction across the growth rings. This makes flat/plain sawn boards warp. As shown in the picture, ideally you would take a larger log and make a whole bunch of covers from it. If you are limited in the size of log you have then method 'A' might work; but I believe the center of the tree may cause issues, in some species at least. Don't quote me on that though. Another option would be veneering over thin plywood. A, an extreme example of quartersawing, is the way to go. B will not so much warp as check catastrophically. Not the answer you're looking for? Browse other questions tagged warp moisture making-lumber or ask your own question. What is a good way to prevent jointed tabletops from bowing when tightening fasteners or the glue sets? How do I cut a large log into boards? Using thick branches to make an end-grain cutting board? How can I design a large speaker cabinet to come together square and true when my panels aren't flat and my boards aren't straight? Any way to straighten this wood gate piece?